Known as its biggest and most loyal “fan club”, The Friends of Canterbury Cathedral celebrates its 90th anniversary during 2017 and has some exciting events coming up to make sure it is a birthday year to remember. The events kick off during the Cathedral’s Open Garden weekend when on Saturday 27 May, a new garden dedicated to the Friends and planted next to the Buffs statue at the east end of the Cathedral will be opened. 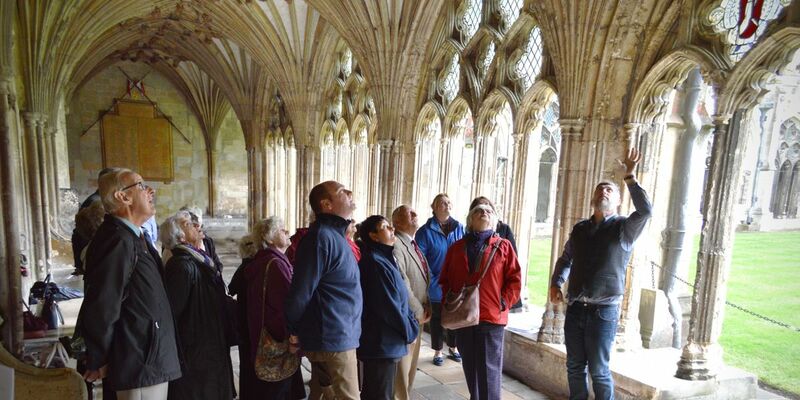 On 8 July when the 3,200-strong membership is invited to join special tours and events at the Cathedral, the Friends’ trail will be launched. This has been put together by Cathedral volunteers to celebrate the enormous contribution that the Friends have made to conserving and enhancing the Cathedral building and its community. During the last 90 years the Friends have given the equivalent of almost £14 million and the new trail will lead visitors around some of the various projects that the Friends have supported during their history. On 16 September there is an exciting opportunity for the local community to come together in The Big Friendly Sing. This is open to singers of all abilities who would like to spend the day rehearsing Handel’s Messiah and then give a performance in the evening in the Cathedral Nave joined by professional soloists. Musical director for the “Messiah-in-a-day” will be Cathedral Organist and Master of the Choristers David Flood. The 200 spaces are filling up fast so if you would like to join – particularly male singers – email friends@canterbury-cathedral.org for a booking form. Audience tickets, priced at £10, are also available. During the year Friends have also been set a challenge by the Dean of Canterbury, the Very Revd Dr Robert Willis. Known as the Dean’s Challenge supporters have been coming up with inventive and unusual ways of each raising £90 – to reflect the organisation’s 90 years. Suggestions already coming in include playing 90 hymns in 90 minutes, giving up beer and donating beer money, holding coffee mornings, a cake baking competition and the Bishop of Dover, the Rt Revd Trevor Willmott and his wife Margaret are opening their Canterbury garden between 2pm and 5pm on Saturday 3 June to support the Friends. The Dean is the chairman of The Friends’ Council and one of the Friends’ greatest ambassadors. The last event of the of the 90th year will be a special evening on 25 November in the Cathedral Lodge to celebrate the Dean’s 25 years as Dean of a cathedral. In front of an audience of Friends, the Dean will be in conversation with Friends’ trustee David Knight and will talk about his life and work as an Anglican priest. Founded in 1927, The Friends of Canterbury Cathedral is the oldest organisation of its kind. The following announcement was published in a letter to The Times on 20 June 1927 – “to gather round the Cathedral in association with the Dean and Chapter a body of supporters who are prepared to take some share in caring for it and in preserving it for posterity.” It was greeted with an enthusiastic response and 800 members enrolled by the end of the first year. Under the stewardship of Miss Margaret Babington that number had almost doubled by the end of 1928 with members living all over the world and that international support continues today amongst the now 3000 members. The Friends have given the equivalent of almost £14 million towards various projects to enhance and preserve the Cathedral since they were first formed. Their initial project was the restoration of the Water Tower and during the last 90 years the long list includes donations towards the statues of HM The Queen and HRH The Duke of Edinburgh; £250,000 to assist The Canterbury Journey – the current conservation work; a new minibus for the choristers, repaving of the Nave; new stained glass workshop and stonemasons’ yard; repairs to Bell Harry and the blazoning of 800 shields of arms in the Cloister. The photograph shows Jason Chipperfield, who has been working on the Friends’ trail with fellow volunteers Alyson Osterloh and Cassie McGoldrick, talking to Friends about their research in the Cloister.